In December 2013, animal studies was initiated in sheep at St Olav’s Hospital to investigate if the Unravelling Stent causes less restenosis compared to traditional stents if implanted in the iliac artery. 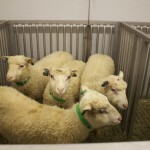 Male sheep has been used for this study. The study consists of different parts, and is planned to continue until March 2014. So far, it has shown promising results and has given many insights regarding product development and experimental design of further studies. The study is performed at FOR (Fremtidens OperasjonsRom), the Operating Room of the Future, at St Olav’s Hospital. In this facility, advanced research is being performed with state of the art equipment. The initial pre-clinical study on the Unravelling Stent will be finished in the late spring of 2014, after histology and statistical analysis have been performed.